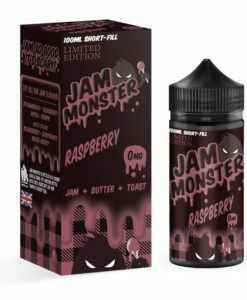 Jam Monster is one of the most popular brands to come out over from the United States. This company has absolutely nailed the flavours of Jam on Toast with some butter, naturally. Originally the brand started with Strawberry and Blueberry but the over the months we were spoiled with Apple Jam and Grape Jam which took the UK by storm! Now we have Blackberry Jam which has proven to be fan favourite! This line is available in 100ml 0mg Short Fills. Enjoy!